God planted a beautiful garden in the east of Eden where he put Adam. The Garden of Eden has many kinds of fruit trees that bear delicious fruits that are good for food. In the middle of the garden, there is the tree of life and the tree of the knowledge of good and evil. God made four rivers that went out from Eden to the garden. The first river is called the Pishon River that waters the land of Havilah, where you can find gold. The second river is called the Gihon River that flows in the land of Cush. The third river is called the Hiddekel River which flows toward Assyria. The fourth river is called the Euphrates River. God saw that Adam is lonely and have no one to help him with the work so he decides to make the animals and birds to keep him company. After he created every beasts and birds, he brought them to Adam to let Adam named them. And so Adam named all the animals one by one. That is how the animals got its name. Adam feels that there is still no suitable helper for him and so God made Adam fell asleep. While Adam was asleep, God took one of his ribs and then he closed up his flesh. From the rib, God formed it into a woman and brought it for Adam to see. Adam was so comforted and happy that he found his suitable mate. 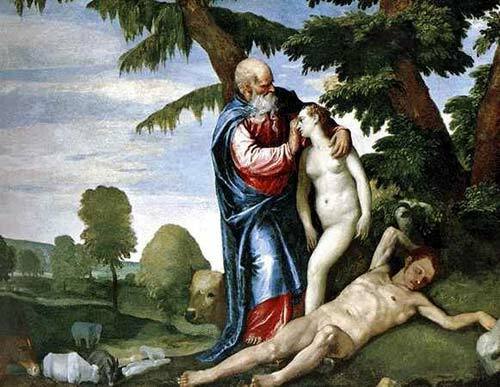 Adam named the woman Eve because Eve came from his bones and flesh. Therefore, when a man grows up to be an adult, he will leave his parents to be with his wife so that they will be one flesh. Adam and Eve are both naked, and they don’t feel ashamed at all.